The show has already ended, so we are to give you some of the highlights! We were front row at IMM Cologne 2019, that’s why today we are here to give you our top 8 stands at the German trade show. The days completely flew by, but we were able to assist conferences and collect a lot of material about the brands that were featured there. Curious to see how the event was? Then keep reading! Let’s start with the most mid-century stand you will ever find: the DelightFULL and Essential Home Stand. Although the space was too little for the brands, it still looks amazing. From the lighting designs to the furniture pieces, and even the jazzy vibe, everything looked on point! 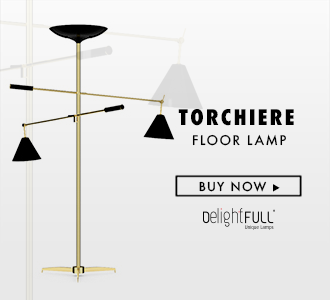 Right in front of DelightFULL stand, you had Poliform. In case you’re not familiar with the brand, Poliform is currently a leading player on the international furniture scene. The highly successful result of adventurous enterprise, the company has always based its vision on the search for quality by updating its lines in keeping with all that is good in contemporary lifestyle trends. This is a story about a family, one that orbits around two Italian enlightened entrepreneurs, Luigi and Paolo Bestetti, it’s about the DNA characterizing the Italian family companies, sprouting from the love of material and carrying around the manufacturing culture. With so much experience in the field, it is a pleasure to have visited their stand in the German trade show. Birkenstock is a global brand and it is not only one of the top five global footwear brands but, it is also one of the most well known German brands in the world. Their stand was based on nature, wood and natural products in very distinct areas, such as beauty, footwear, and small decor pieces. An amazing concept that completely stood out there! Fatboy is – as many people think – not named after the firm shape of the beanbag, but after the artist Fatboy Slim. The last 15 years, Fatboy has developed considerably. The beanbag is without any doubt the ultimate hero, but Fatboy does a lot more than just creating beanbags. The collection has expanded into a diverse range of iconic products: from lamps and carpets to side tables, hammocks, and the Lamzac. Nowadays Fatboy the Original is available in over 60 countries. This was the perfect spot to chill after walking miles around the fair. Calligaris is a company that keeps up with the times, perceiving the present with that sensitivity that allows for the most interesting and fruitful ideas to be transformed into furniture and decorative accessories ready to enter people’s homes and find their place, creating unique spaces that speak volumes about their occupants. A stand worth watching very well decorated and inviting. This company, the first one that used the Murano massive glass as a base for its tables, has always been privileging the use of high-quality materials, such as glass, marble, forged iron, and wood, applying new contrasts and technological processes on the cutting edge, with a craft mastery. Very well located, this stand was full of furnishings that express the perfect synthesis of technology, design, research, and tradition. With a forceful synergic relationship between design and production, Flexform has a long history of fertile interaction with more than one generation of great designers. Flexform had an amazing stand at IMM Cologne, that we can assure you.